Hi girls, I hope you've all had a great Easter! Formula was very consistent on all of these : thin but easy to work with, I used 2 careful coats plus topcoat and that was enough for complete coverage. Application tip : as always with pastels, make sure to have enough polish on the brush and wait between coats. piCture pOlish Jade is a bright jade green with silver shimmer. The shimmer is very fine and subtle but still visible, really sparkly somehow. 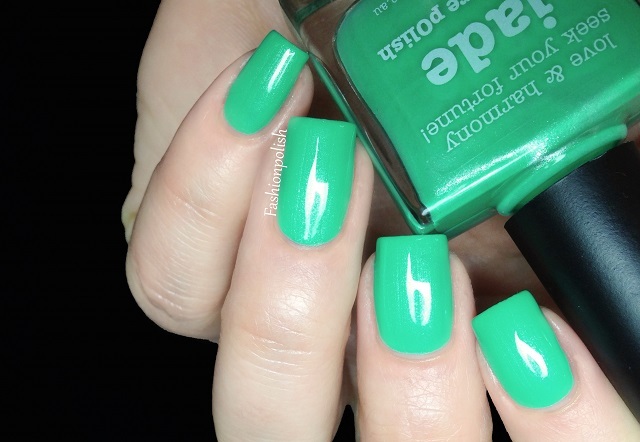 piCture pOlish Honey Dew is a soft yet bright mint creme. I'm always afraid of major lobster hands with mints but this one looked particularly nice with my skintone, so pretty! piCture pOlish Tiffany is a pastel turquoise creme. It's very close to Honey Dew, just a tad bluer and just as beautiful. I'd have a hard time picking a favorite. piCture pOlish Sky is a very pale blue creme. I didn't know what to expect in terms of formula and application but it proved to be just as manageable as the other three! I think these are the very first piCture pOlishes cremes I try and I must say that I'm impressed! I don't know about you but I love how they all look together. piCture pOlish aJde, Honey Dew, Tiffany and Sky retail for AU$10 each and can be purchased directly from piCture pOlish.com.au or through their international network.